After many months of waiting it it finally here. 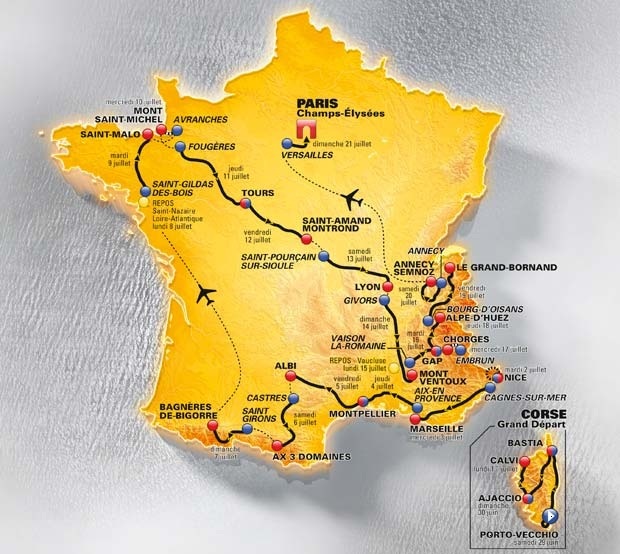 The 100 TV Tour de France or Le Tour has its grand depart today in Corsica. We will, over the next three weeks, get to see who can battle the course to be champion in Paris. We know it won’t be easy and Froome will be up there with Contador plus a few others for the fight for the title. That battle for yellow overall won’t be won today. That will be for the sprinters. Let’s hope Mark Cavendish it’s the best in the bunch sprint and gets to wear yellow for a day at least, before focusing for the green points jersey. Like many others who will be watching this years tour offers something different from the last two. Yes we have a clear favourite, plus he is in the form of his life, but there are so many other contentious out there. Let’s see what happens over the next three weeks. Enjoy. 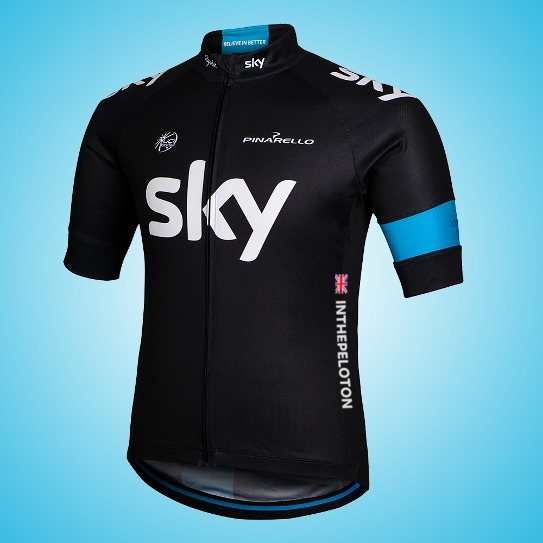 So being a fan and supporting the only British team in the Tour de France InThePeloton now has its very own Team Sky jersey. At this stage it is only an avatar but I’m sure someone at Raffa or one of the other sponsors will get these into production especially if Froom wins. Well that may be a few weeks away, and until then I’ll wear my avatar with pride, or the blog will anyway. The waiting is nearly over. 3 days until the start of the 100th Tour de France. Will Mark Cavendish be in Yellow at the end of the first day which is set up for the Sprinters. Lets hope so. I think the 100th tour will be a good one. Last year returned Sir Brad as the first British winner and with a bit of luck we could have Froom taking the honours in Paris in three weeks with Cav returning to glory in Green. At this rate the UK will be targeting all the jerseys, although the King of the mountains could be a struggle this year. The route is an interesting one. It is a shame Sir Wiggo won’t be there to defend his title and we will never know if he decides not to ride the tour again. Lets wait and see. There are many stages to look out for in this years race. I think one of the most important ones will be Stage 18 Gap to Alpe D’Huez where the riders will climb the famous mountain twice with the finish line at the top of the second summit. If Froome manages this with a lead or gains the lead on this stage he will be in an excellent position to take the 100th tour, his first victory and the second for a British rider. 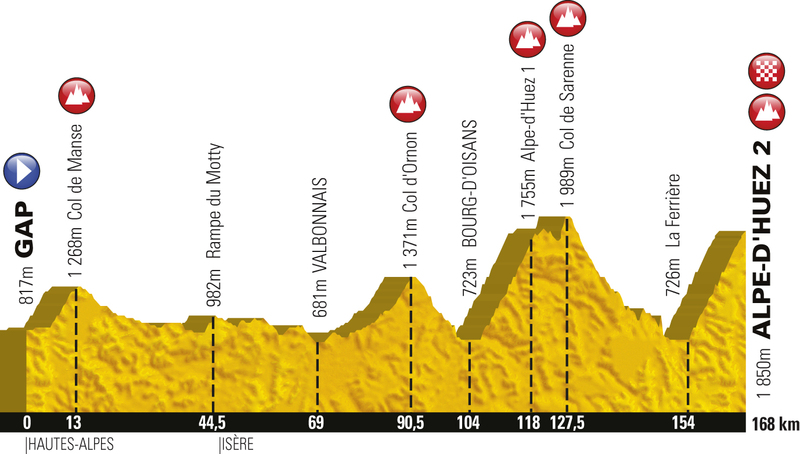 It might only be 168km long but the fact on this stage they are going over 4 big climbs at a high altitude before the final climb up Alpe D’Huez for the finish. In my opinion its stages like this that make the tour what it is. The physical and mental challenge the riders face must be phenomenal, just for this stage alone, but the fact they have been riding for 17 stages before this just proves these riders are something special. So I all starts on Saturday, at last. For the next three weeks cycling will rule my life, watching the tour as well as a certain ride In doing on 14th July, eek! This entry was posted in Uncategorized and tagged Alpe d'huez, Gap to Alpe D'Huez, Stage 18, tour de France. no live coverage on the two television channels of the National Road Race Championships. At least there is highlights tomorrow night (Monday 24th June) on ITV4! Next weekend and for the following three weeks both British Eurosport and ITV4 will show live coverage and highlights of the 100th Tour de France, but today nothing. Please, please get this sorted for 2014! I know there would have been reasons for not covering the race live, but I think a glorious opportunity was lost today. I ask why that one of the biggest events in the road cycling calendar is not covered live? Later in September they will be coverage if the Tour of Britain which is great but over the weekend we have had many of the worlds top rivers in UK road fighting it or for the honour of wearing the national champions jersey. I have to say a massive thank you to Twitter for my coverage of the race. It certainly added something, as it was very nerve wracking watching the action unfold in 140 characters or less but annoying I could not watch the action live on TV. After all the south east is along way from Glasgow where the championships took place so couldn’t attend live. @BriSmith (Brian Smith Eurosport &ITV4 commentator) @cyclingweekly and @ BritisjCycling et al kept me and the world updated which the action. Without this fantastic service it works be the old fashioned way of finding our the result in the paper tomorrow or doing A Likely Lads and trying to avoid the result until watching the highlights tomorrow evening. So the result. Stop reading now if you don’t want to know the result of both the men’s and women’s races. AllI will say before saying who won I’d I might be getting one if the jerseys when they are on sale which I have a feeling will be very soon. So here it is the result. A big well done to ladies champion Lizzie Armistead who won on Saturday and the men’s champion, yes you guessed it, the Manx missile Mark Cavendish. He will wear his new national champions jersey in the tour next week, well until he gets the yellow one after stage one and the green points jersey for leading the points classification. I think the OPQS jersey in UK champions decorations will be a nice sight to see. We have seen the Sky version with Ian Stannard and Wiggo a few years back, but now its Cav’s. The top four in the rave will all be of to the tour next week so it easy a strong fiend which you expect for your national championships. Well done to the top riders for their participation. Next year lets hope this key event in the cycling calendar is covered live so we can all enjoy the event. After all isn’t cycling gaining more popularity? It would gain more covering it live! This entry was posted in Uncategorized and tagged British EuroSport, Cycling, Glasgow, ITV4, Lizzie Armistead, Mark Cavendish, national championships, NRRC, OPQS, tour de France. I knew our challenge was real as I experienced the ride last year. However when talking to another participant of this years ride yesterday they said they had received their pack, and mine had not yet arrived. As you can see mine came today. Again like last year the fact I will cycle from London to Brighton has really got home again. The strange thing is I feel ready for the ride and knew it was coming. The sponsorship is getting there (£40 to go), the bike is a dream to ride and I feel good about attacking the route for a sub for hour time. It’s not until your pack arrives that it seems task and I don’t know why but it is. I have to say the pack is a great improvement from last year. The map us in much more detail, taken from an OS map. It is the size if a map too which is good but lets face it you are unlikely to get lost just follow every other rider. Saying this we did take a wrong turn last year due to a marshall not being in the right place. So now it’s time to put the finishing touches to my ride preparations. Time to get my gels from the local bike shop, get the bike serviced in the final week before event day and arrange two light rides for the final week. Also need to eat chicken with some pasta on the Friday and get some sleep Saturday afternoon. This I didn’t manage last year as it was so got on event day. I now feel part of the team now my pack has arrived. It real. I am doing this and helping make a difference. I have been able to combine raising money for an excellent cause by completing an activity I really enjoy. I really am quite lucky to be able to have this opportunity. Sub for hours here we come. Fingers Crossed. 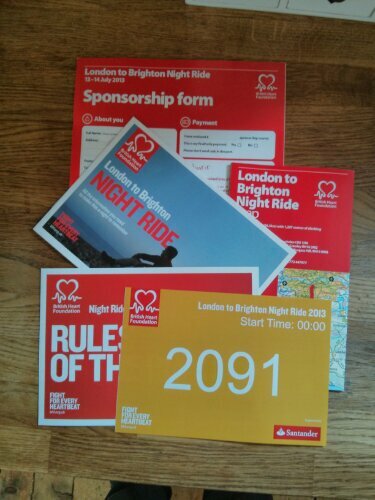 This entry was posted in Uncategorized and tagged 13/14th July 2013, charity bike ride, London to Brighton, night ride, The BHF. I knew our challenge was real as I experienced the ride last year. However when talking to another participant of this years rife yesterday they said they had received their pack, and mine had not yet arrived. As you can see mine came today. Again like last year the fact I will cycle from London to Brighton has really got home again. Well you can now get close to the action as your own Director Sportif by selecting a 9 man team from the pro riders who are riding in the 2013 Tour De France. You get 20m Euros to build your squad and can have no more than 2 riders from any Pro Team. Unlimited changes until the start of the tour and then 20 throughout the three week race, with a maximum of three per stage. You don’t have to do the maths to say you need to be cleaver with your choices. I would normally now justify my choices. Well if I did that would be giving others an advantage, or would it? Go on spend a few minutes putting together your team and lets see how we all get on. You can see my team here http://rcuktourdefrance.fantasyleague.com/Team.aspx. Its totally free and a bit of good harmless fun. This entry was posted in Uncategorized and tagged cycling.fantasy cycling, fun, tour de France.